Robert Smalls School was completed in 1953 and named for black Civil War hero and Reconstruction-era politician Robert Smalls. It is significant in the area of education for its association with the South Carolina “Equalization School” building program. This was a state initiative in the early 1950s to make schools for black children “separate but equal” to their white counterparts and in support of the practice of segregation. It served as an African-American school until it was desegregated in 1971. When it was constructed Robert Smalls School housed grades one through six. It was used as a school until new elementary and primary schools were constructed in the 1990s. 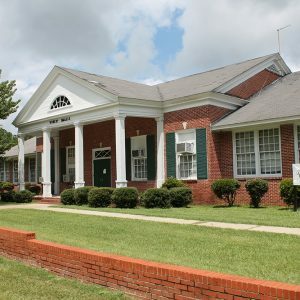 The school is the only remaining example of the “separate but equal” schools in the Cheraw area, and is also the only school building that predates 1965 remaining in the Town of Cheraw. The school was added to the National Register of Historic Places in 2014.